Trainer Liam Birchley (left) has high hopes he can get runners to the Magic Millions Classic. Liam Birchley has put plans for Villiers winner Crack Me Up on hold while he concentrates on maintaining his proud record of starters in the $2 million Magic Millions Classic. Birchley won the Group Two Villiers at Randwick with Crack Me Up last Saturday and is yet to make a final decision about the gelding’s next start. 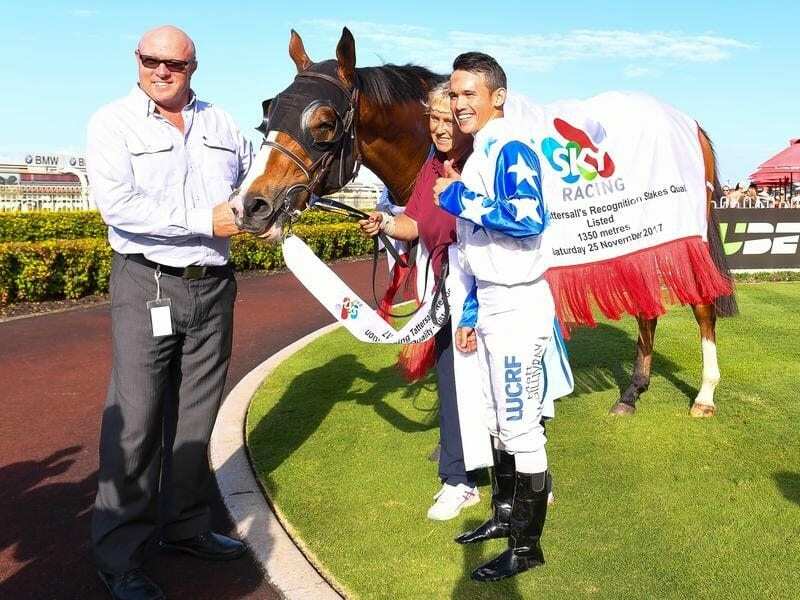 He is tossing up chasing a $100,000 bonus on top of the $195,000 first prize in the Bernborough Handicap on December 30 or running in the $1 million Magic Millions Cup (1400m) on January 13. “I will probably wait to see how much weight he gets in the Bernborough before making a final decision but at this stage I am just sitting on the fence,” Birchley said. Crack Me Up is having a freshen-up at Birchley’s Archer Park near the Sunshine Coast but will be back at his Eagle Farm stable next week. Birchley has a proud record of having at least one runner in every Magic Millions Classic in the past 11 years. He is yet to win the Classic but has had several minor placegetters including Paprika’s close second in 2009 behind eventual Golden Slipper winner Phelan Ready. Birchley is also the most successful trainer in terms of bonus payments for horses wholly owned by women in the Classic with winnings totalling more than $1.2 million. He isn’t getting carried away with his chances but has Awesome Mo and Peppi La Few in the two divisions of the 2YO Handicap (900m) on Saturday. “They are both Millions horses but things would have to go really well on Saturday for them to make the Millions,” he said. Awesome Mo showed a lot of pace before finishing fourth in the Pat O’Shea Memorial at Toowoomba at his first start in October. “He’s had two trials and finished second behind a handy horse in the latest,” Birchley said. Peppi La Few, a first starter by former superstar galloper Pierro, has also had two trials and will race in blinkers for the first time. Fellow trainer Gary Moore has also made a gear change to Parquirri in the first division. Parquirri was green when third to Magic Millions hopeful Jonker at Newcastle and Moore believes pacifiers will make him race more truly.